In GLIDR Enterprise, it's likely that you will have several Projects running simultaneously. 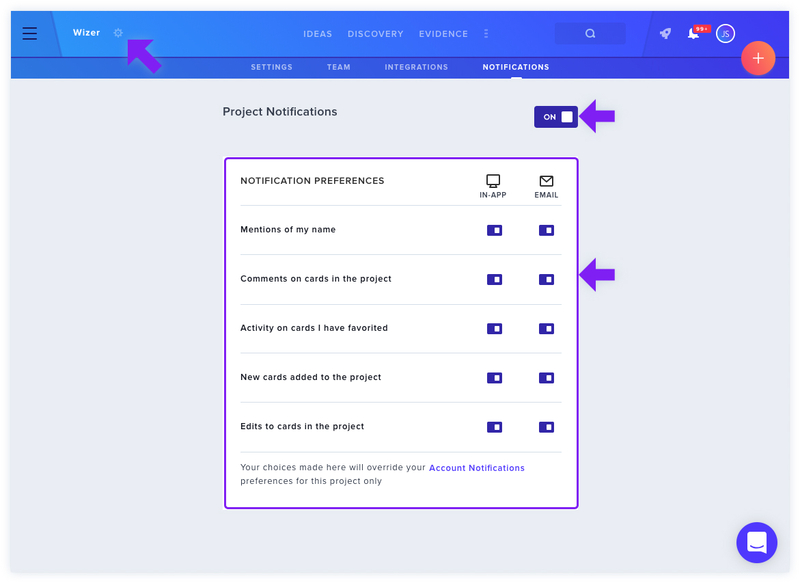 While you can change your overall Notification Preferences by heading to your Account Menu, you can also update the notifications for individual Projects. Click the Gear Icon next to your project in the left-hand navigation and click Notifications at the top. You can select the notifications that you would like to receive. Mentions of my name: notifies you about your @mentions. Comments on cards in the project: notifies you about updates that are made to one of your contributions. Activity on cards I have favorited: notifies you about updates to an item you have favored with the “star” icon. New cards added to the project: notifies you about new cards added to this project. Edits to cards in the project: notifies you about updates made to a card in this projects. Find out more about managing your Project settings.